I've read the hole theme but I still miss any excat idea or number of the scale. I've somewhere read about 1/90 - what is your opnion? Well, I’m not sure what you are asking, exactly: The Heller kit is in the scale of 1:100, which works out pretty neatly to 1/8” = 1’. 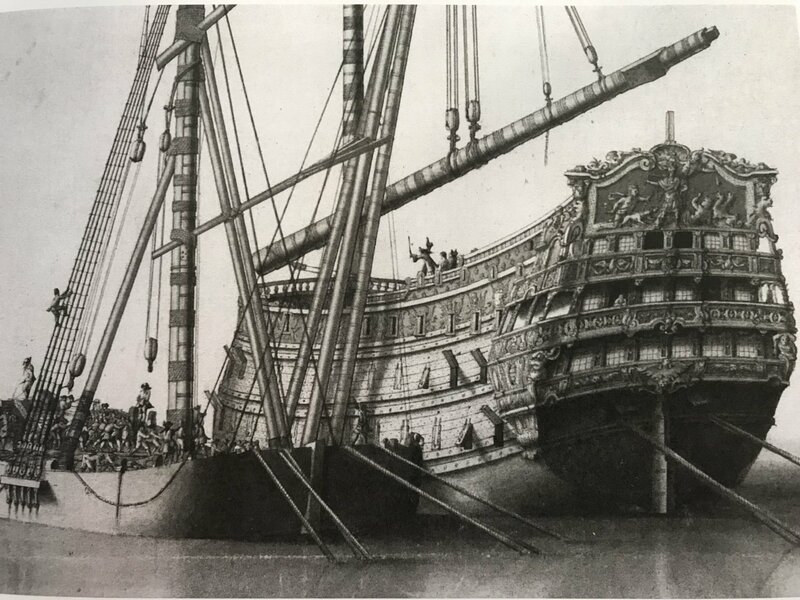 If you are asking what scale this would represent for the Saint Philippe, then one would have to take the actual length and breadth of the Saint Philippe and convert that to a common unit (I know inches and feet, so I would use inches), and divide that by the length of the kit main deck, between stem and sternpost, in inches. That would give you a reasonable idea of scale. Now, as it relates to my conversion of the Heller kit into her 1689 appearance, I have so far used 1:100 as a guide for scaling my new, scratch-built parts, but I won’t really have much of an idea what scale my broader and longer model is (relative to the known dimensions of SR1), until after I have mounted my hull halves on their flat bottom and built up the transom to the main deck level. Once I get there, I will take measurements between perpendiculars, just for fun, but the answer hardly matters for this model, as it is an impressionistic effort, and not a wholly realistic one. I just want to see whether my greater breadth and length bring the model closer to scale with the actual ship. For my purposes, though, 1:100 is a good enough guide. With the exception of a tallow/lead white for the small portion that will be visible below the waterline, I have found all of the other colors I needed for the upper bulwarks. Although it will be used pretty sparingly, this Holbein ultra-marine was just the right shade that I was looking for. It will be a nice counterpoint to the Cerulean blue - which is probably too vivid a color for this time period, but I prefer it for artisitic reasons. Utrecht is the manufacturer of this irridescent gold. The ornaments should really pop against the yellow ocher of the frieze lattice. My beakhead bulkhead, the stern and the area between the main deck guns will be done in this red ocher color, with the acanthus escutcheons picked out in yellow ocher, ultramarine blue and the fronds and Royal monogram in gold. I think that the quarter galleries might also feature this red ocher color, but I have not figured out which areas that might look good on, as the QGs cross over the blues of the upper bulwarks. Perhaps the amortisement will be mostly Cerulean blue and red ochre from the main top wale down. Or, maybe the QGs will be all red or all blue. The answer will become more clear as I go. My SR will be a vivid riot of color above the top wale. It has been a pleasant holiday season, and I hope to soon get back to the scraping/paint prep of the lower hull. My St. Philippe monograph arrived while I was away, and though I have only skimmed through it - it appears well worth the investment. I will be very busy in the new year. Beware thar the feet and inches are Royal French so a foot is 324.8394mm long or 6.5746 per cent longer. Easier multiplicate with 1.065746 - to be safe I also add the metic lengths. The best gold colours I've ever got are from the Citardel series easy to get at Warhammer Shops for little money. No goldcolour has such a fine metallic effect parts in it and there are two types of gold and some very good inks for shadowing. The service level of consulting in the shops is very high. Perchance you find something pritty intersting also for the cabin's interieur. That's wonderful. In between have you decided to build a vaneere deck? Hello, Heinrich. Yes, I have also found this book by Winfield and Roberts to be a great help, and the depth of their research lends the work great credibility, IMO. These are the dimensions I will be checking against. I have also lately become acquainted with War Hammer, as my Godson is really into it. I visited their shop in lower Manhattan, recently, and was quite impressed with the array of colors. Of course, there is no shortage of YouTube videos that demonstrate how to layer their paints and use distress washes to pick out details. I will probably re-visit their store for a really light distress wash for experiments in toning down my upper bulwark colors just a little bit. As for the decks, I am leaning toward making them from styrene sheet for several reasons. First, I can easily lay out and scribe in the tapering plank widths, and the plank butts on their beam locations. 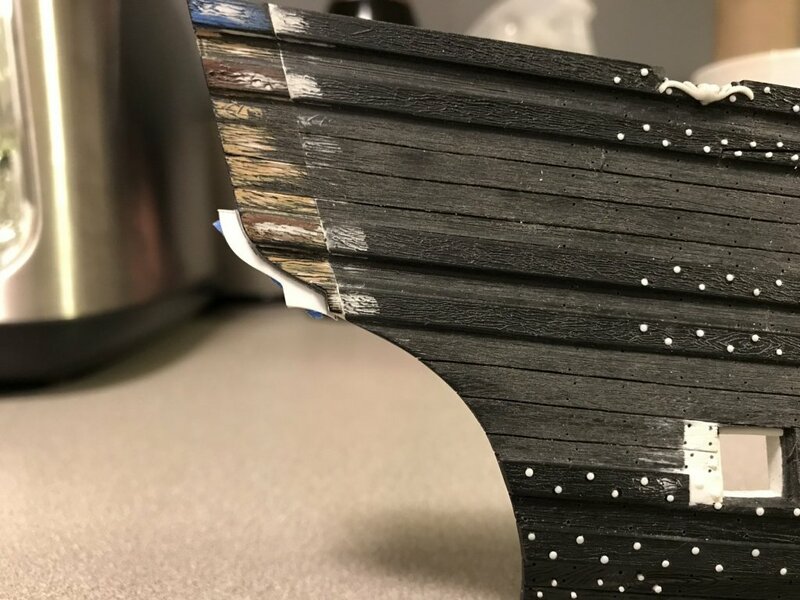 My earlier paint experiments were quite a success, and I think that one of my samples would make a really good deck treatment. 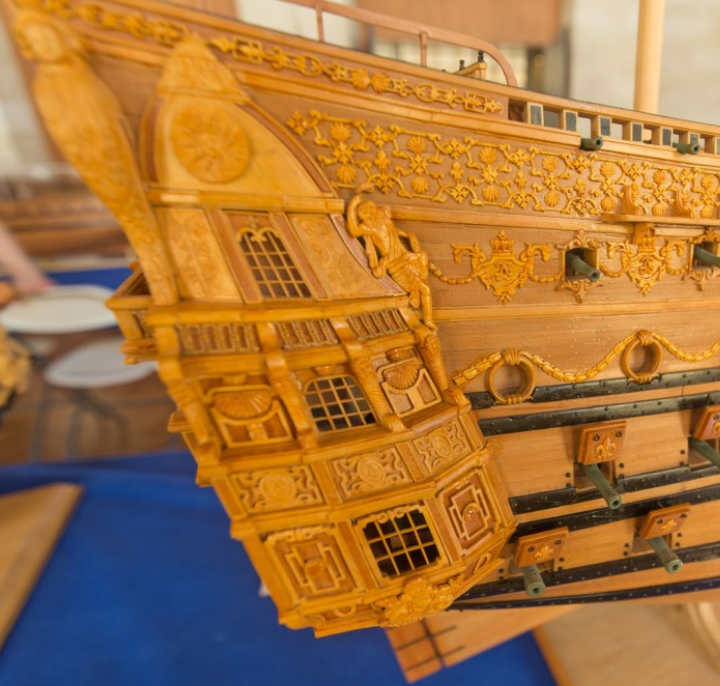 Also, I’m not sure the marriage of a real wooden deck (scribed veneer, or individual plank) wouldn’t seem jarring on what is mostly a painted plastic model. Finally, as I am going to continue scratch-building deck furniture in plastic, for the most part, I prefer to bond plastic to plastic. I am sure cyano glues are perfectly up to the task of wedding wood to plastic, but this is simply a stubborn idea in my head. Sometime this week, I will do a post on the St. Philippe monograph. 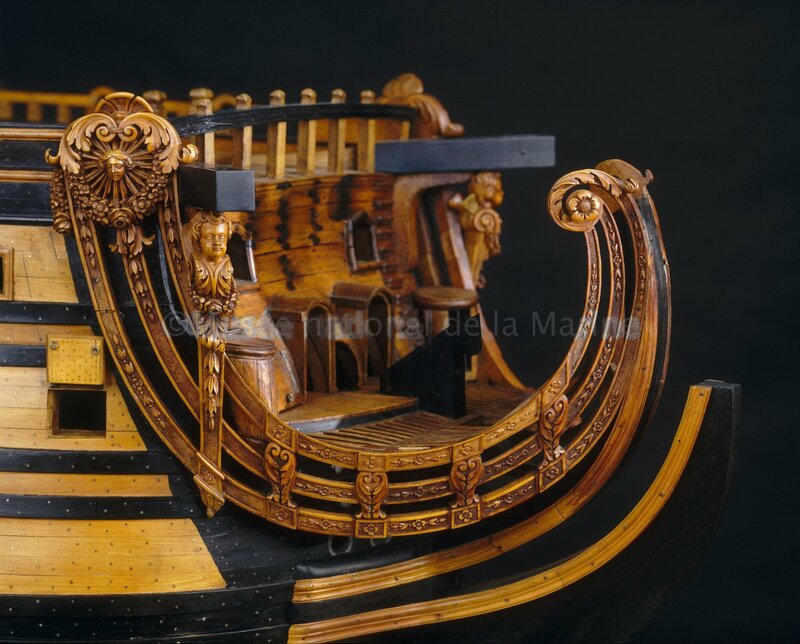 There are a number of really great illustrations that I had never seen before, including yet another of the Royal Louis/Grand Monarque’s stern; this one is a mixture of good detail, reasonably well scaled, but a little primitive in execution. Anyway, he discusses SR, a bit. I still disagree with him, regarding the quarter galleries and their resonance with the Berain stern, however, he does make a few salient points, there, that I will unpack later. 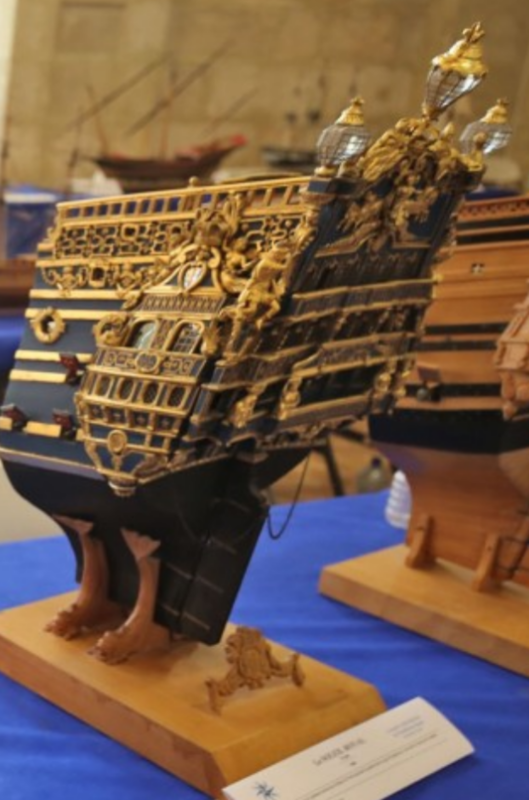 All fascinating stuff, and his reconstruction of the St. Philippe is really superb. Such ist bestly done by "Soleil Royal webmuseo" . Hope that helps and doesn't bring new grey fair to your head - as we say in Germany. Well, there isn't any hair left, so no worries, there! Thank you for this link Heinrich. I will check this out, right now, in fact. I'm also going to pack up your spare parts today and ship them out this coming Saturday. 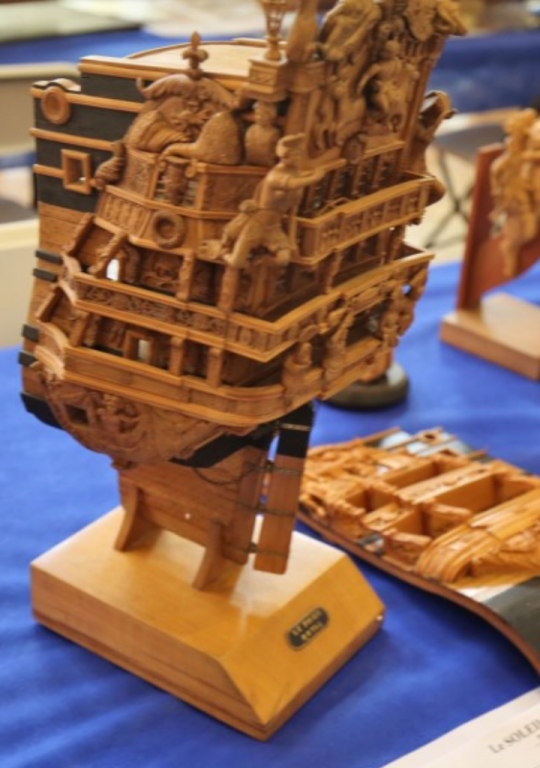 This Tanneron model of the Foudroyant/Soleil Royal, no matter it's omissions and sources of inspiration is still the most remarkable example of the ship carvers' art. I've been sanding and scraping, and thinking about adding some additional through bolting to represent the hanging knees that support the deck beams. 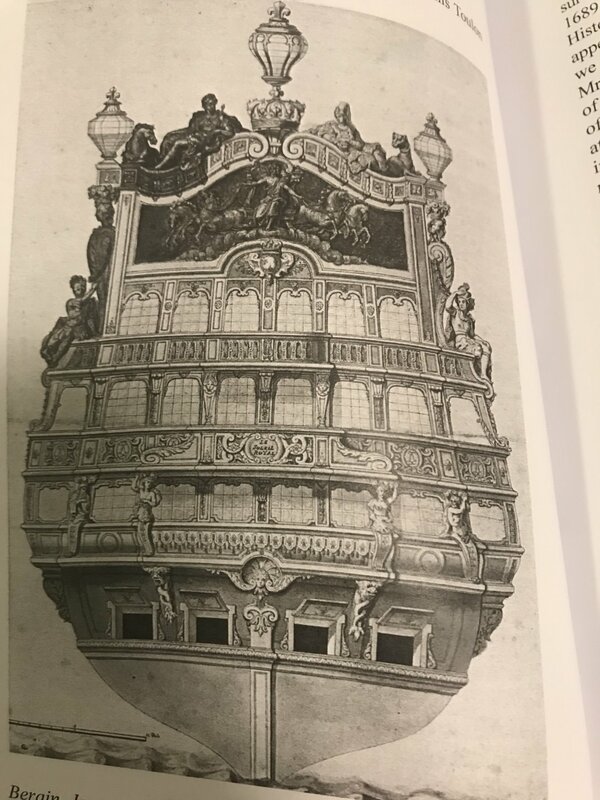 The St. Philippe monograph is really illuminating when it comes to fleshing out certain details, as per example: a notably wider scupper on the middle deck level, in line with the pumps, for quick draining of water from the bilges. 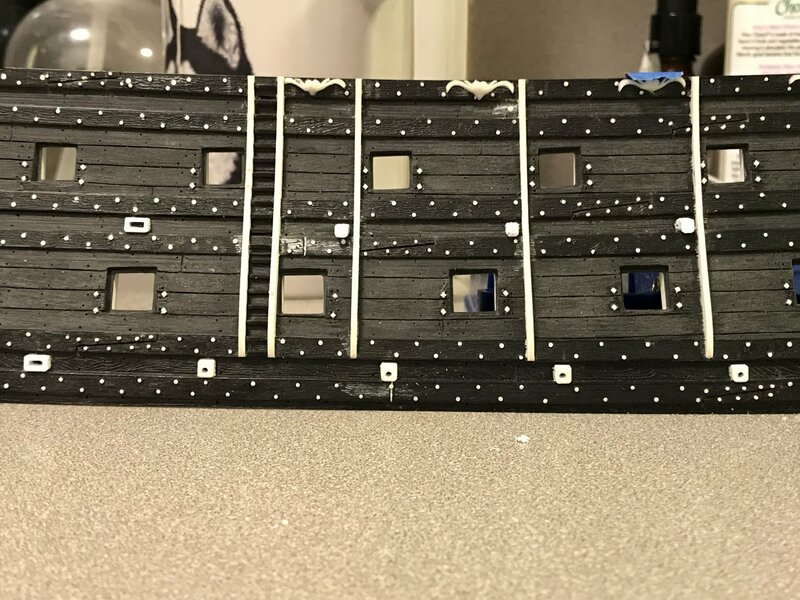 The other revelation is that I need to pad out my construction of the lower stern counter, so that I can properly create a false-gallery ledge upon which the Four Seasons figures can sit, comfortably, and support the main deck stern balcony that wraps to the quarters. So, I'll have to add back a little plastic, there, but it shouldn't be a big deal and it will save me the disappointment of an improbable appearance to my stern counter. This was one of the qualms that J.C. Lemineur raised, concerning the black and white drawing of the quarter galleries that is my avatar. As it is drawn, there is not a proper ledge for these rather large figures to rest upon. Now that I understand this better, I have to agree with him, there. I do not, on the other hand, agree that this detail, along with the incongruities between the QG figure of Africa (sans elephant head dress) and the way the figure appears on the stern drawing, completely discount the credibility of this representation of the quarter galleries. 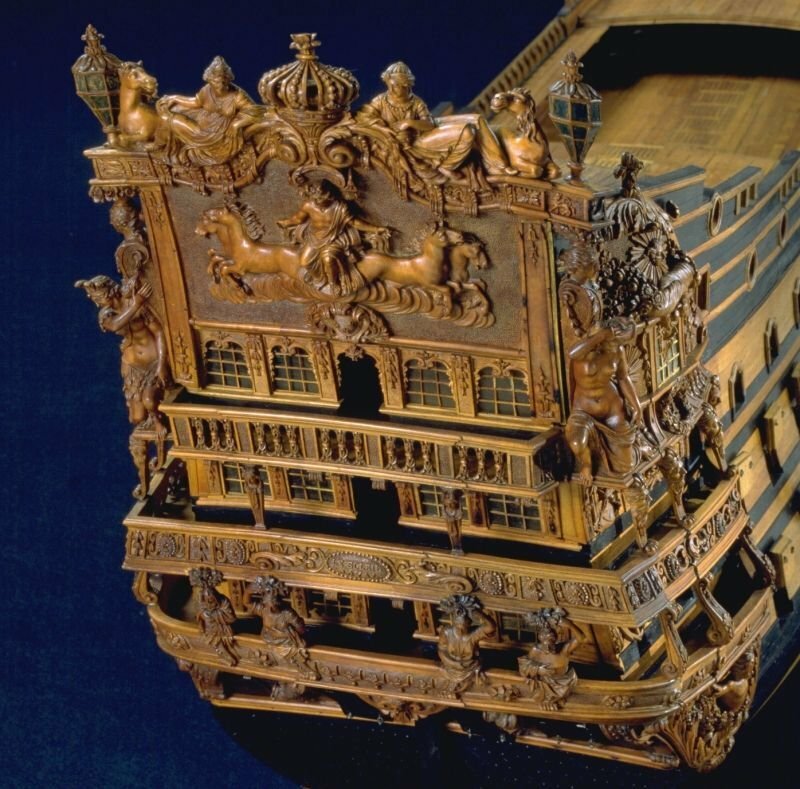 As I have detailed at great length, earlier in this log, there are many corresponding elements between the stern and quarter galleries, with regard to mouldings, banding arrangements, and the shape of the windows at each level. Mr. Lemineur comments on the improbability of the fish-tailed, butterfly winged mermaid figures that flank the quarter gallery, however, I personally believe that this may be Berain's nod of the cap to the earlier styling of the Puget figures that likely graced the first version of the ship; Puget was fond of split-fishtailed figures supporting each layer of the gallery. In this way, I think that Berain may have been attempting to incorporate a sense of continuity into this later development of the ornamental scheme - in other words, that the ship would not be totally unrecognizable from it's earlier appearance. In fact, the filigree banding that borders these color gouache drawings by, I believe, Etienne Compardel (Lemineur cites Pierre Vary as the creator of this color portrait), includes vividly colored representations of these split-tailed figures, amidst the very Berain-styled banding of the filigree border; something new rising from something old. As with most of what I write, here, this is all theoretical and may be completely wrong. I don't believe it is implausible, though. And the reason I cite Compardel, as opposed to Peter Vary, is that it bears many direct similarities to this known Compardel portrait of the Konung Karl. 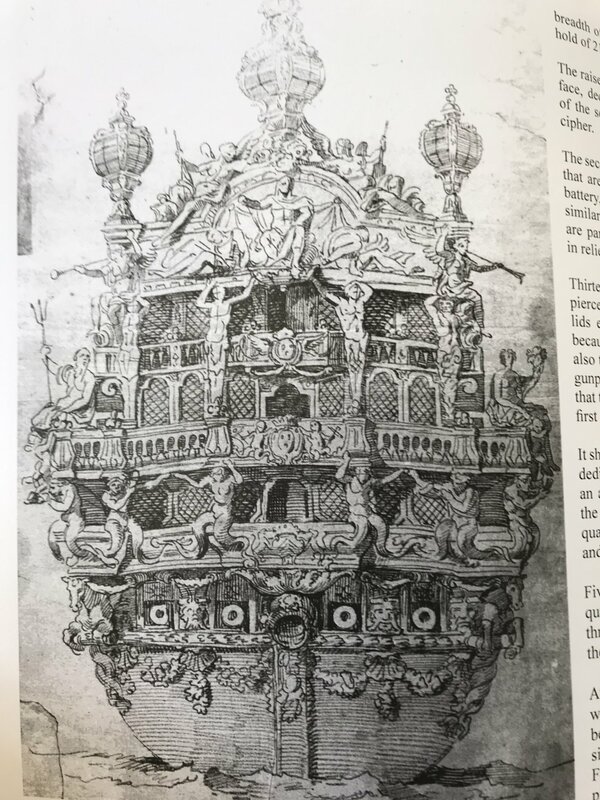 At the time that Berain had taken over the artistic oversight of ornamenting the King's ships, there was an established relationship between Berain and Compardel, as noted by Andrew Peters in his book, Ship Decoration 1630-1780. 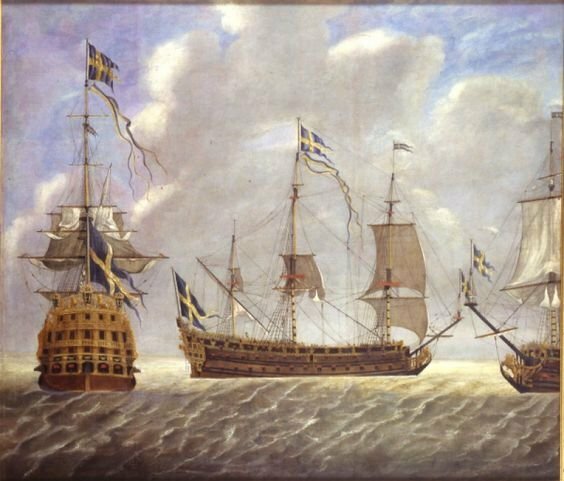 Not only are there similar issues of proportion and scale that show up in both of these ship portraits, but the particular style of rendering the sea and sky is nearly identical. I leave it to you all to form your own opinions, though. that gold leaf masterpiece by heinrich......i wonder how large that is.....i think that if i had a choice and support when i was young, i would have loved to have been able to learn to sculpt like that...forget this modern stuff....but i sure can appreciate it!!! No it isn't my work... but all this gives further details to us. 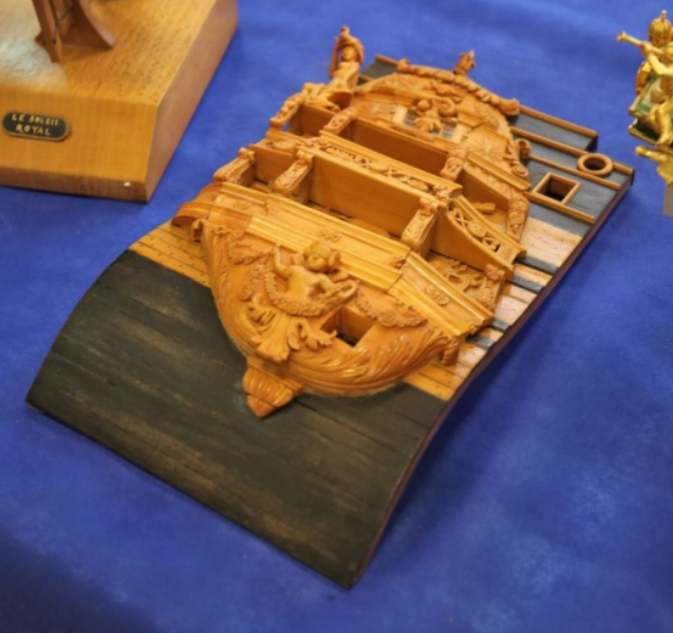 As these pictures from the Congress international de modelisme navale -1st naval modelers congress in Rochefort (18.-21.Oct.2018) very much show is in the first line part-models of the SR.
Now these show to all of us Your decission to use the evergreen sheet for a deep craved sculptural decoration structure was complety right! Look what is done in between 1/48 and 1/36... 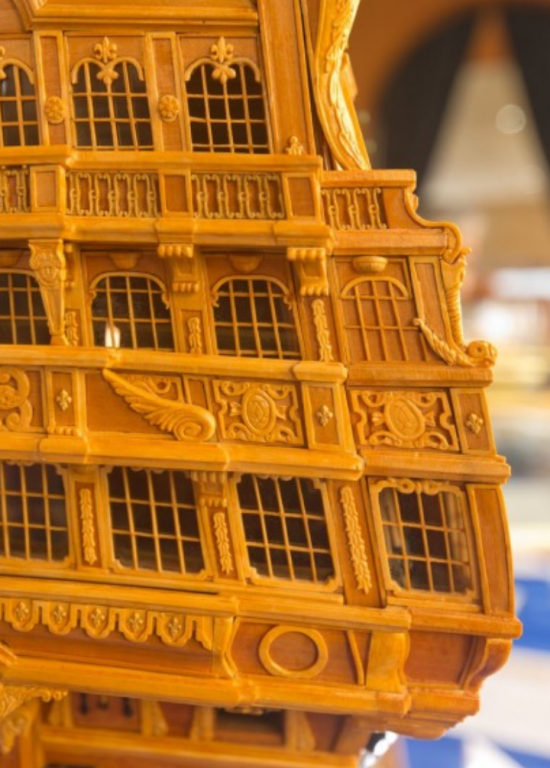 The barock plastic ship really needs the additive of such structures - you are the pioneer, Hubac! Hello friends of the Heller SR! 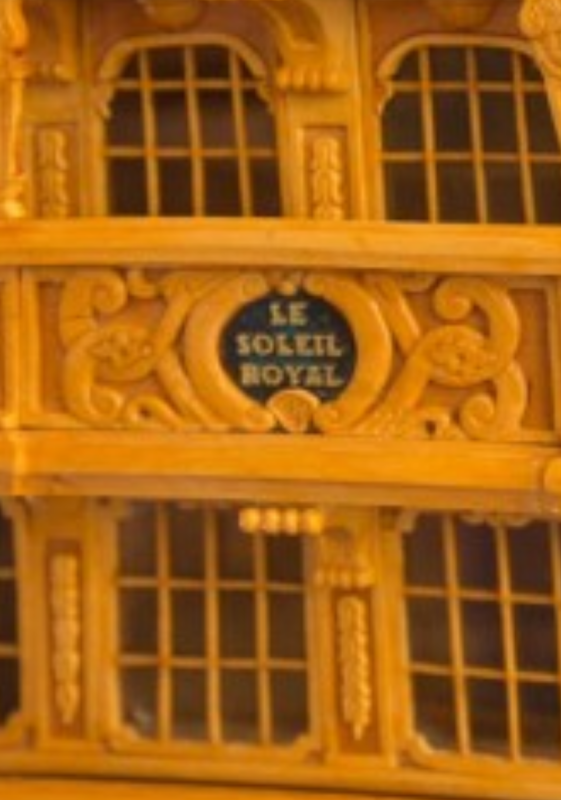 The very intersting point is this one: What did the real SOLEIL ROYAL looked like? So we (as HsH does) need a list of the „disgusting, bare and awefull“ al list of all the Errors, mistakes, lies, wrongs, shortcommings of the Heller SR-kit to the real ship. So we very much do need a historically correct SOLEIL ROYAL as HsH is going to give to us all in here. Thanks a lot Hubac!!! But I would like to point out, that we are still working with half a dozen to ten pictures. ItIallways is globally allways the same we are repeadingly staring at. So what shall we do? I stared to dream about a small data-warehouse in that we store all the information, questions, kit traps and solutions. How can this be managed? This thread is a real diamant pit of information but no data warehouse. You have always to walk the long way through all the intetsting sides - interesting but timeconsuming, fascinating but a long road to travel. As I can't offer solutions I'll shut up after asking my questions... ...and duck&cover! 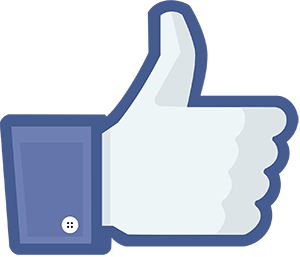 Thank you, Dan, for the Rochefort link - lots of excellent models and perspectives, there, and thank you to everyone for looking in, your likes and comments. Heinrich does raise one of the “issues” with my build log - that being that it is lengthy and tangential, and as I write most of this on subway trains - it’s a rambling stream of consciousness on the subject of SR and her times. I do have a tendency to go on (see below). I will never say that I can provide an accurate glimpse of what SR1 looked like at any time in her career - the closest to approach that are the scholars; Michel Saunier, Marc Yeu, and J.C. Lemineur, whose latest monographie on the St. Philippe provides a highly plausible (IMO) starting point for creating a hull form for SR1 (1689). But, really, Michel and Nek0 (Yeu) have already crossed this threshold - paying particular attention to the subtleties of SR1’s pre-1673 transom. The only thing I’m striving for, here, is an impressionistic attempt at historic plausibility. Speaking to Heinrich’s suggestion, though, maybe I can create an image database in a separate topic thread, in the general forum, where a wider cross-section of MSW might see and have some knowledge of these portraits and images that I’m struggling to identify and put into a period context. I will make an attempt at brevity, in my captioning of these images. 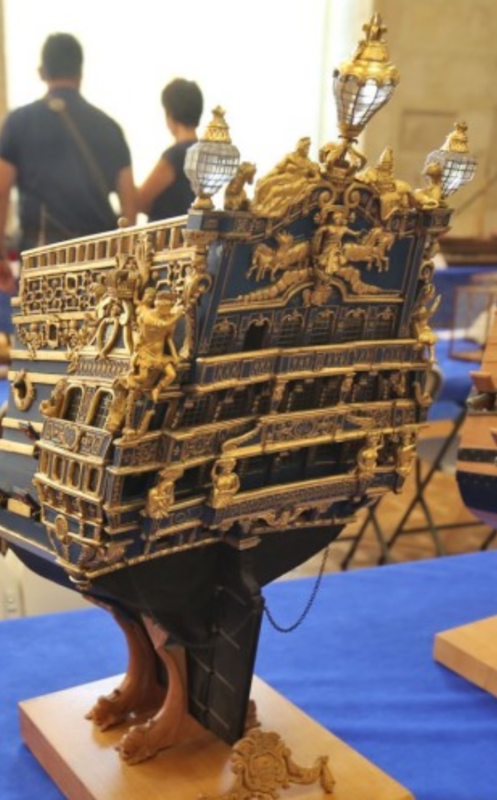 Maybe call it something like Colbert’s Navy Under Louis XIV. The absence of any visible shadows leads me to believe that the middle tier is closed. I could probably go either way﻿ with this, but I'm sure the answer will become ﻿more clear to me as I render the quarter galleries,﻿ and ﻿come to fully understand their shaping and convolutions﻿. With all the faults of the baroque epoche (kitchen two miles away from the dining room at Versailles) the shipbuilders and „shipdrivers“ stayed very conservative and with an eye to the practical usage (hitting away the overwelhming decoraton). So the question I ask myself is always zhe same: What is it used for and can it fullfill its job? Can it do it as it is shown in the drawings or may we have to alter something in a historical possible way so it will work. Hello, Heinrich! Yes, this passage you are referencing is from early in my build-log, when I was still pretty uncertain of the quarter galleries, and not yet aware of the amortisement. Now, it is much clearer to me that the officers’ toilet exists only on the lower, middle deck level of the quarter galleries. The Saint Philippe monographie illustrates the structure of the QGs very clearly. 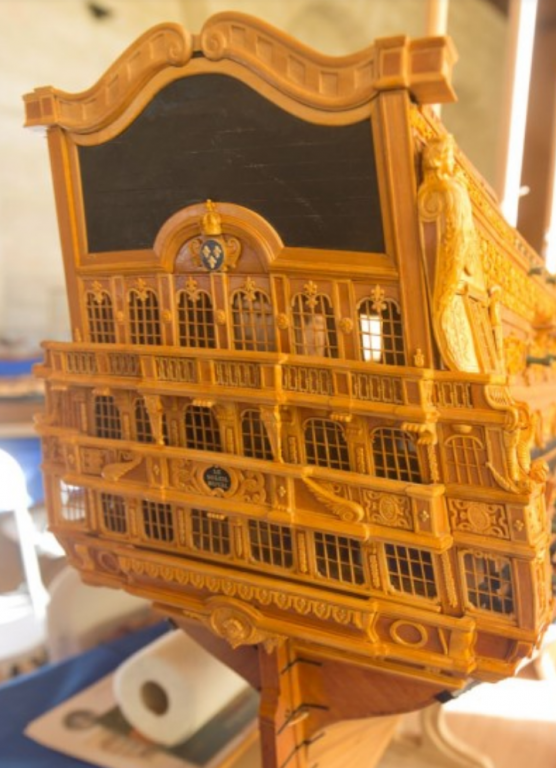 In fact, the only substantive difference between SR’s reconstructed stern in 1689, IMO, and the SP of 1693’s stern would be the presence of an abbreviated, projecting stern balcony on the quarter deck level. On the SP this is represented as merely a false “gallery”. 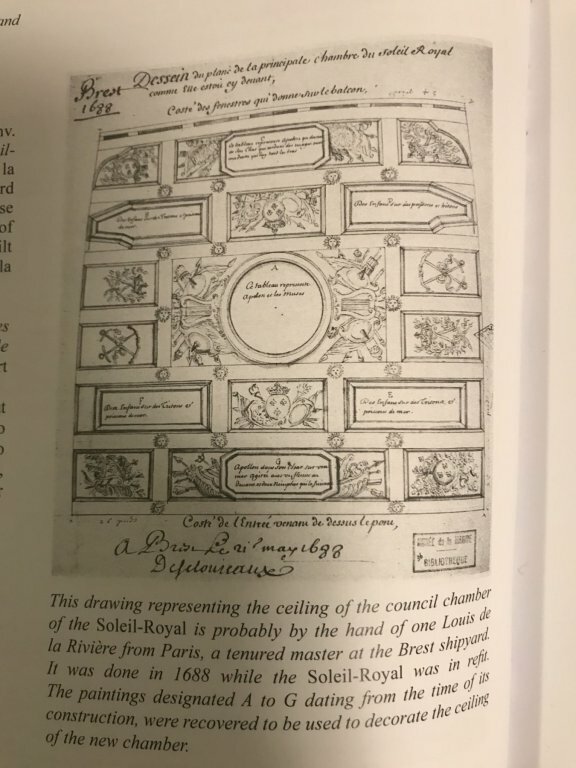 Speaking of the St. Phillipe monographie, I’ve read through a little more than half of the plates with all of their pertinent notes, and on the whole, I am really impressed with Mr. Lemineur’s comparentalization of the ship interior. 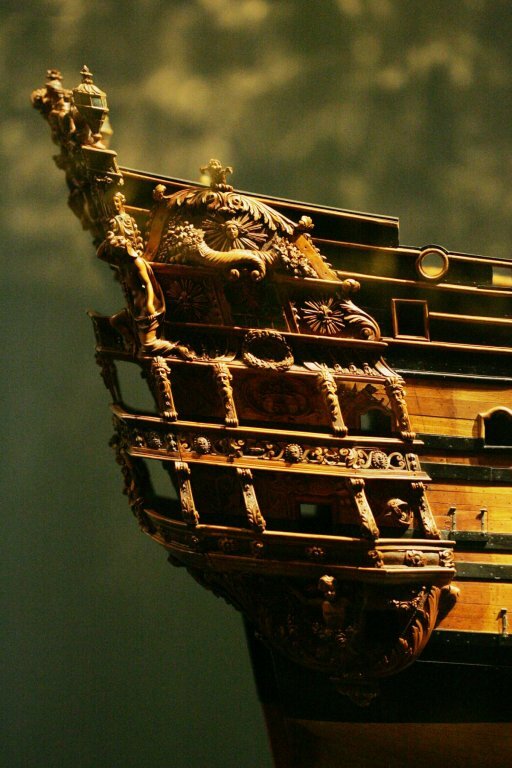 He gives an excellent perspective on the interlocking construction of the ship’s timbers, and good engineering explainations of the ways in which these innovations counter-act hogging forces. It is clear, though, that there was a concerted effort to complete the text and the models before the Rochefort conference, and certainly, the text could have benefited from a more rigorous editing. There is evidence in both the text and the two models that they were rushing to finish it in time. It isn’t just typographical errors, but missing information when describing proportional ratios to derive one framing member from another. That happens kind of frequently. Nevertheless, one could fill in the blanks by measuring off the plans, which are exceptionally well drawn. The important thing - the translation into English is really quite good and very helpful in coming to understand the subtleties of the architecture from this period. It would be nice for that price, however, if the monographie itself were hard bound. 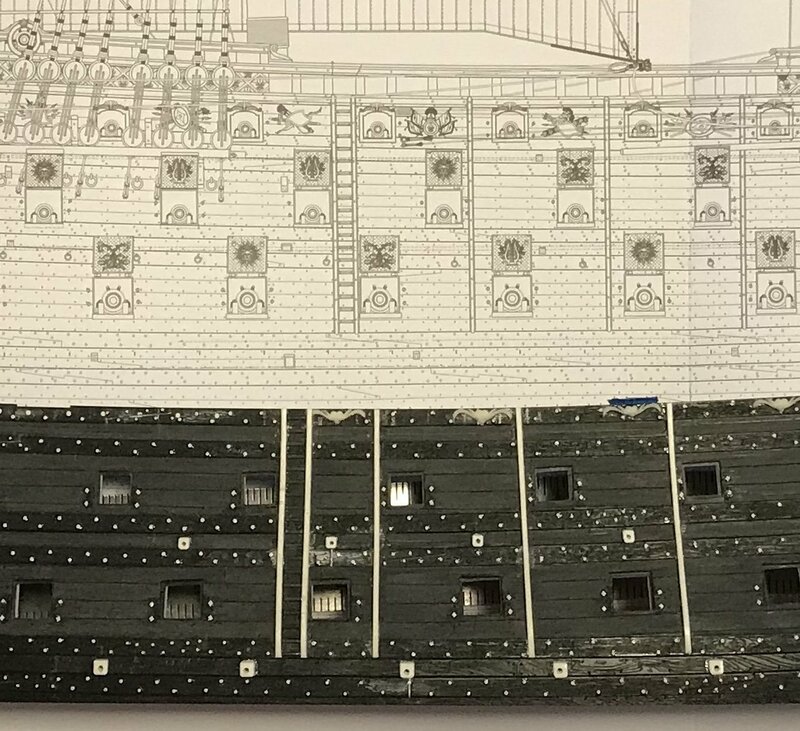 Instead, the text comes encased in a hard cover folio, along with the plates (44 plates in 1/48 scale, and, one 1/96 plan view of the fully rigged ship). I take issue with two details of the re-construction. 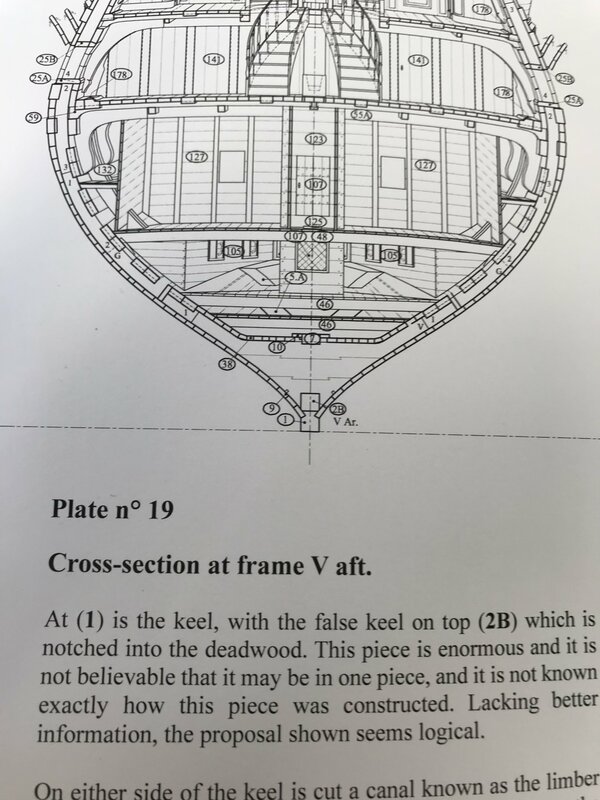 I don’t understand why he is describing the “false keel” as being sandwiched between the keel and keelson. 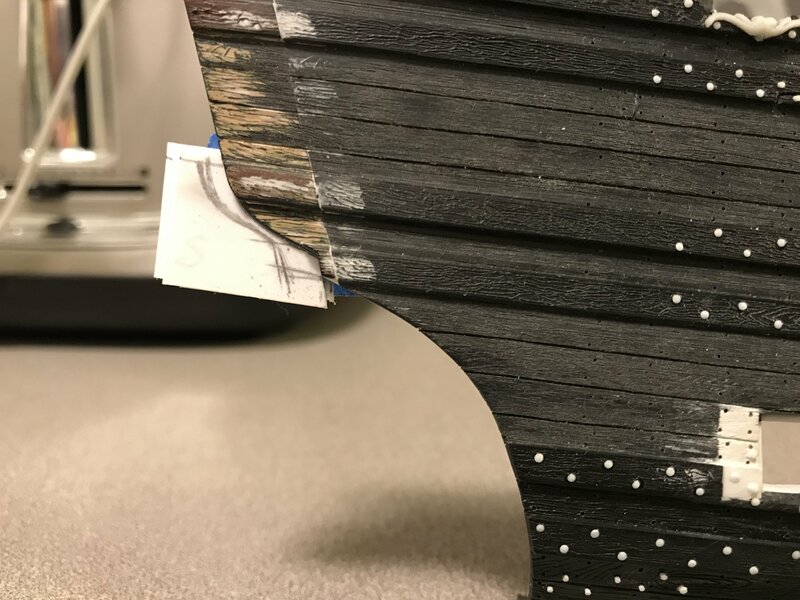 Further, it does not make any practical sense for the joint between the keel and the false keel to be located just above the upper (interior) edge of the rabbet line. So, there’s that. The other thing that jumps out at me is the depiction of the gammoning extending down, below the water line. I don’t personally know whether that is right or wrong, but it is the first time I have seen that and one would think that you wouldn’t want an important brace to be immersed in water all of the time. There are many gems to be found and appreciated throughout this epic reconstruction, though, and among them are the following two period portraits. 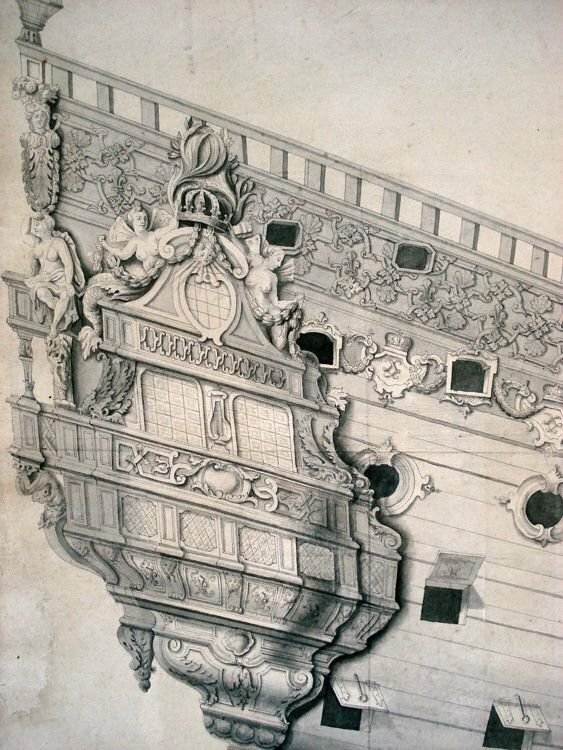 In continuing our debate of the Royal Louis of 1668, here is yet another drawing of her stern, which once again, agrees very closely with that of the Monarque. I still don’t know what to make of all of that, but it is nonetheless interesting. I have to get my hands on Commissioner Hyatt’s first-hand description of, specifically, the Royal Louis of 1668. As the caption states, this is a First Rate being fitted out at Rochefort. I am in no way about to argue that this un-named vessel is SR. I will say, though, that with her reverse-cyma curved tafferal and her partially enclosed QG’s, this portrait provides a truly excellent sense for what the refit Soleil Royal must have looked like. As depicted, the ornamental scheme is very much in keeping with the work of Jean Berain. This port quarter view, which shows only space enough above the main deck guns for a frieze of fleur-de-lis, makes a strong argument for Heller’s decision to place the large acanthus escutcheon/royal monogram carvings between the main deck guns. 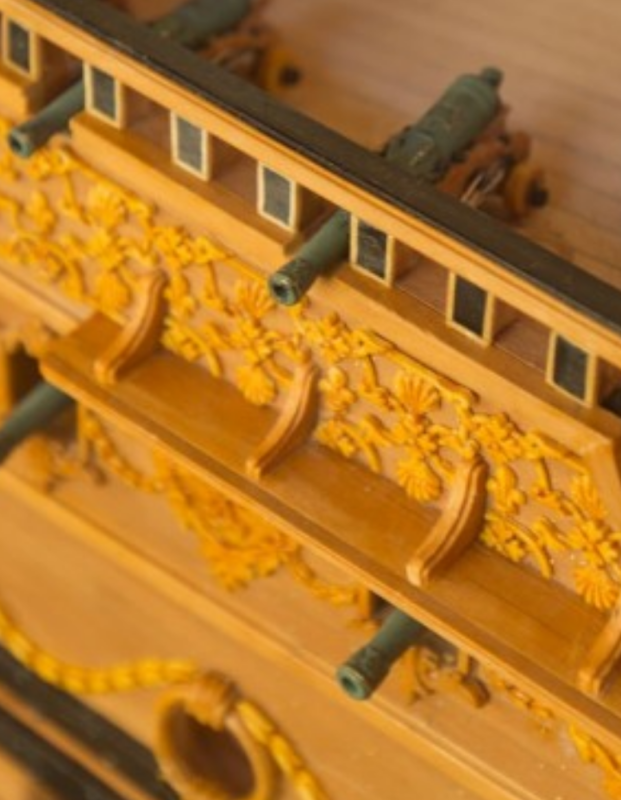 That has always seemed more sensible to me than for those large carvings to be placed between the quarter deck guns. Anyway, that one image is almost worth the price of admission for me. 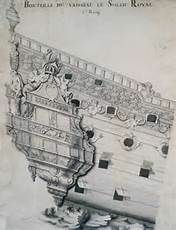 I have for a good number of years, now, been studying this Berain drawing of the stern, and puzzling over the significance of the deliberately dark shaded figures of The America’s, Europe, Apollo and his Chariot, the Port quarter figure beneath the port lantern, and the three zodiac signs. This always seemed strange, yet deliberate. Today, I had something of an epiphany! If it is so that some of SR’s ornamentation was salvaged and re-installed during the refit, then perhaps, these shaded ornaments represent those that were salvaged. When you think about it, at this later stage of ornamentation in 1689, the large figurative works that were so characteristic of Puget’s early work, were largely a thing of the past. 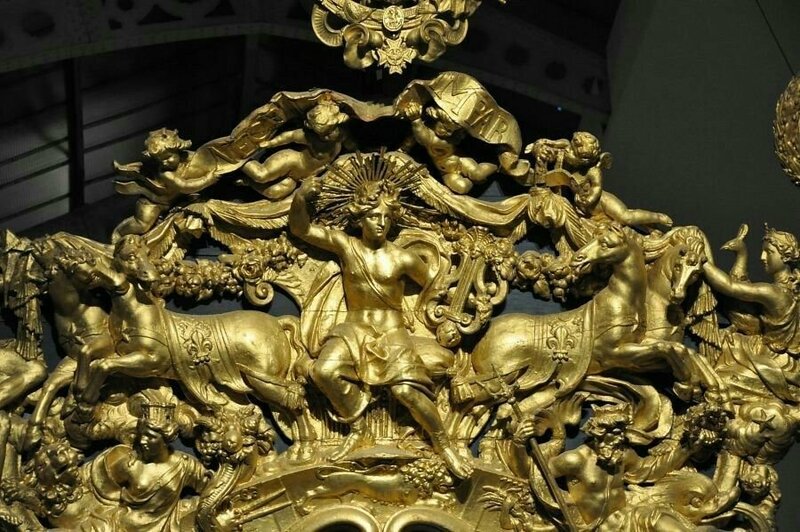 Yet, here are these relatively large figures adorning the stern of SR after her refit. Also consider the archeological convention of reconstructing old bones around the fossilized remnants of the original skeleton. The original bone is darker than the artificial medium that makes up the re-construction. That’s kind of what this drawing reminds me of. 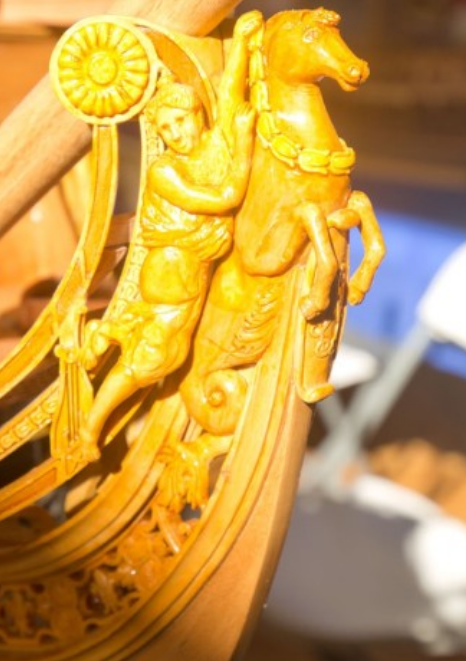 It has been noted by others that the figure of the Orient/Asia, astride her camel, on the starboard side of the tafferal, is actually supposed to represent a tiger. Well, no, I think Berain actually drew a camel. Perhaps, though, the original figure which was too rotten to salvage actually was a tiger, and perhaps Berain chose to alter the figure with a camel. Perhaps. 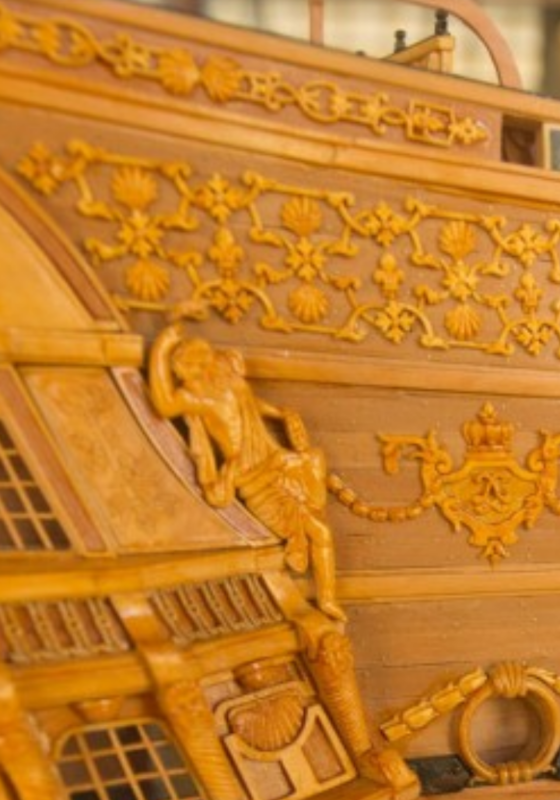 Then, there is the known fact that the coffered ceiling of the Great Council Chamber was preserved and re-incorporated into the re-built ship. This is significant for two reasons. First, the paintings that adorn this ceiling are thematically consistent with Berain’s allegory on the exterior, and thus suggest that there would be some ornamental consistency from Puget’s past into Berain’s present. 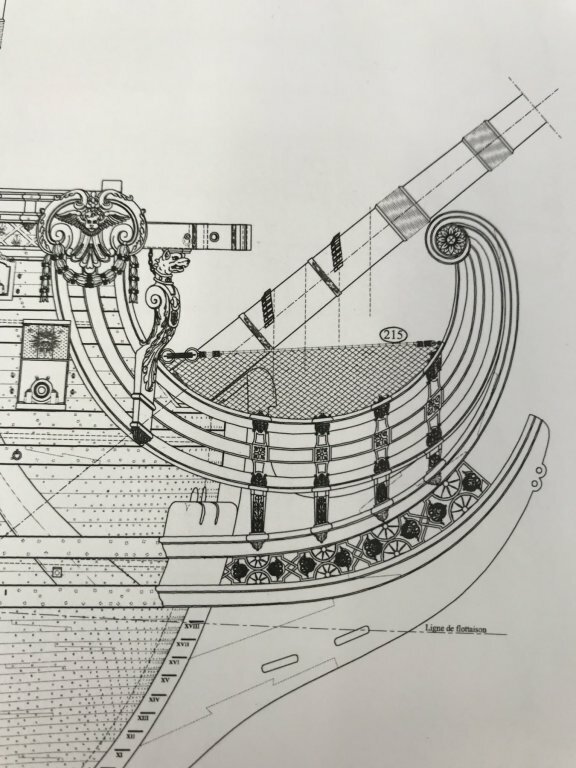 Secondly, the outline of the ceiling suggests that the timber framing of the stern would have remained largely the same as Laurent Hubac constructed it, even if Etienne had to replace most of it with fresh timber. 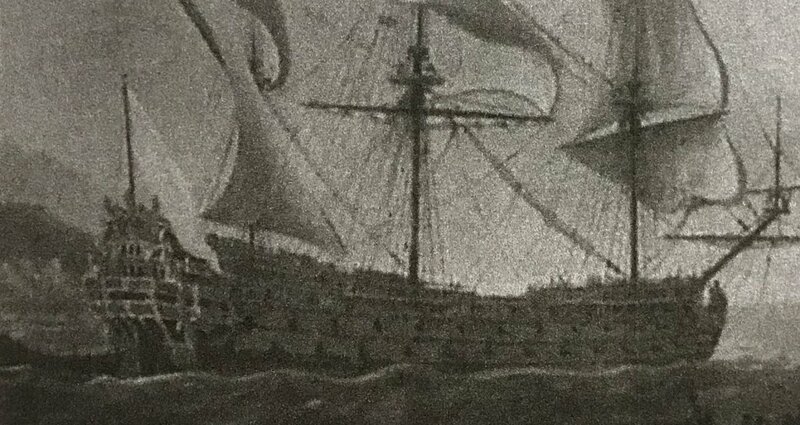 It is not hard to imagine the dilligent son respecting his father’s intuitive framing of the ship’s lines, and thus also maintaining the wing transom above the stern chase ports, as is drawn by Berain. 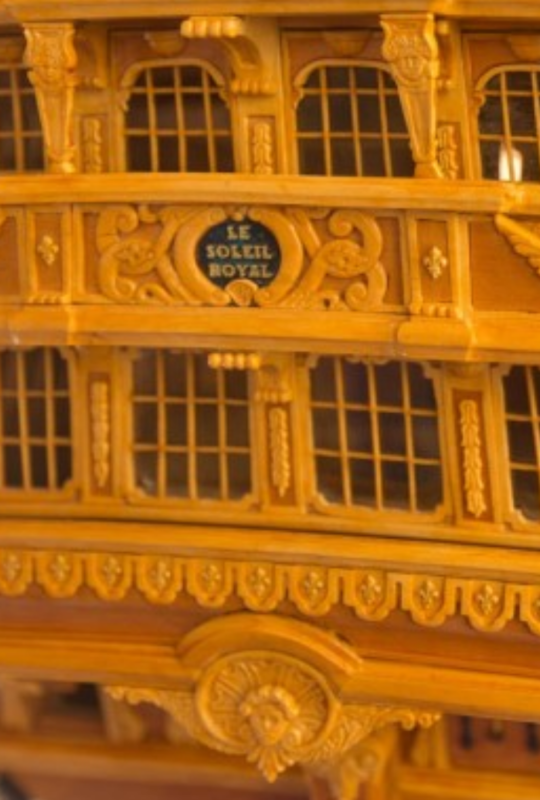 With all of that in mind, it becomes increasingly plausible for me to construct an ornamental tableaux around the vague outline of this ship, which increasingly, I believe to be Soleil Royal, perhaps painted by Puget, sometime between 1670 and 1688. 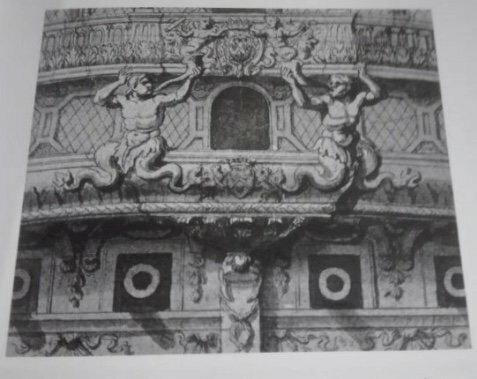 Ornamentally, the allegory would be much the same, but the structure, ornamentation and support of the lower two projecting stern balconies would have been more florid and figurative as Puget designed for the Monarch/Royal Louis. The second is a better drawing provided by Heinrich, which Comes from the German study of the Royal Louis that Chapman first brought to my attention. Or, so this all seems to me. I'm not sure I agree with you on the Berain drawing. To me it looks like shading to maybe add some depth. Note the lower portion of the hull. I also see the shading except for the carvings high up on the stern on a lot of the other drawings. Well, there is shading, yes, and my whole theory on the projections of the stern balconies is based on the shading clues Berain gives us in this drawing. My theory is that Berain is indicating what he re-incorporated into his updated scheme. According to my purely conjectural theory, what is really interesting might be the way in which the Four Seasons busts that support the main deck stern balcony in Berain’s scheme, might actually be an updating of the previous Puget split-tailed Mer-figures that are so prominent on the Monarque/Royal Louis. 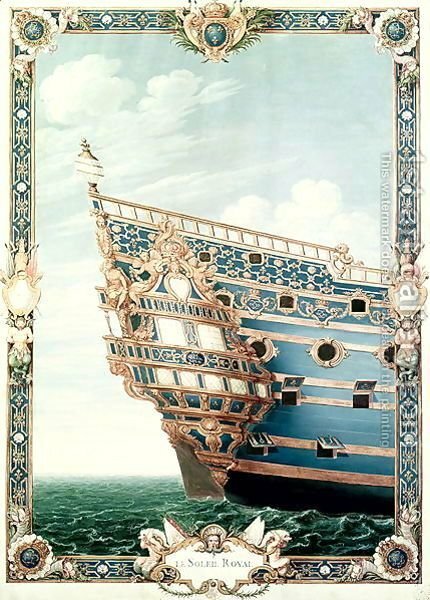 What I’m proposing for my future (Doris inspired) card model, of the purely hypothetical first Soleil Royal is a sort of hybrid between the Monarque and the refit SR of 1689. I can almost picture it in my mind. Soon, I’ll be able to draw it. You might be right then on the shading and what it points out. Pity that there's no "artist" notes on this. After a very nice holiday season, I got back to work on SR. 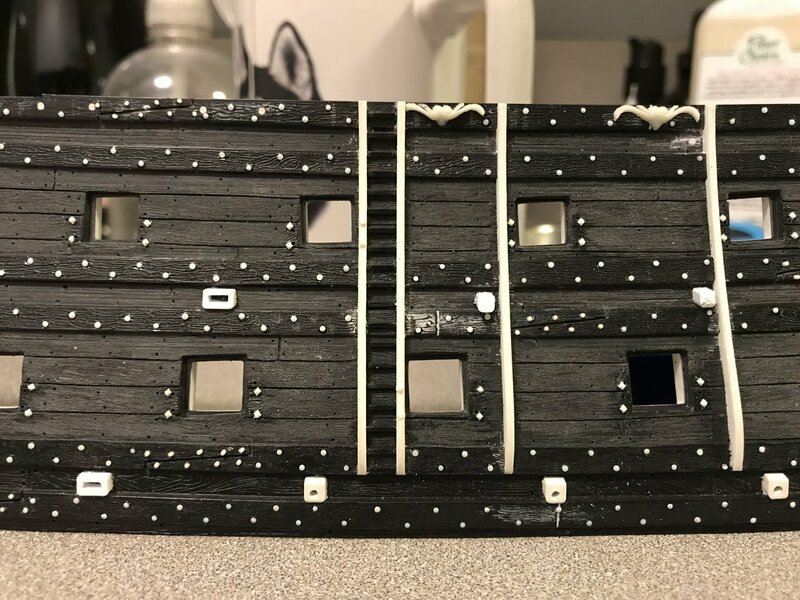 It was tedious to scrape away the faux raised grain along the lower and middle deck run of ports, and to add 60-grit texture, but the effort will be worth it; the paint work will come out as I want it to. 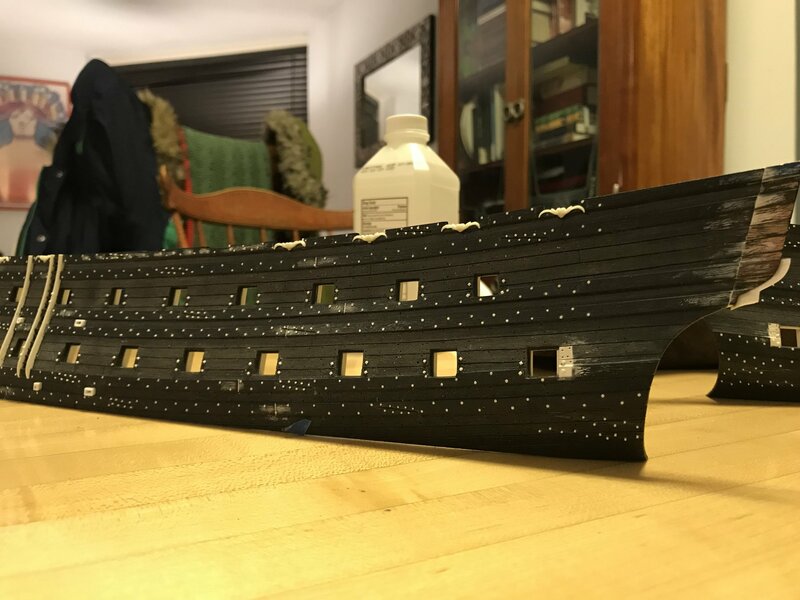 I only broke off a few pieces of my “iron” work, so that shouldn’t be too much extra work to replace, after cleaning the hull shells for painting. One of the more immediate moments of truth, as a result of reading Lemineur’s work on the St. Philippe, was realizing that I had incorrectly placed my middle deck scuppers directly over my lower deck gunports. For all practical purposes, they really should be placed either, just forward or aft of the port beneath. There are two reasons for this. 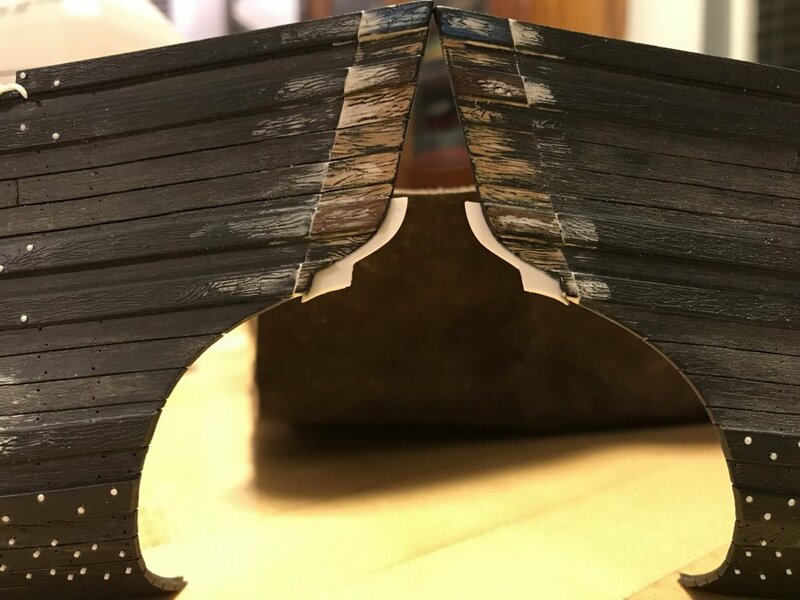 For one, the scupper tubes project beyond the surface of the wales, and would be an impingement to the full opening of the port lids. More importantly, though, whether the lid is open or closed, there should be no obstruction of the scuppers. 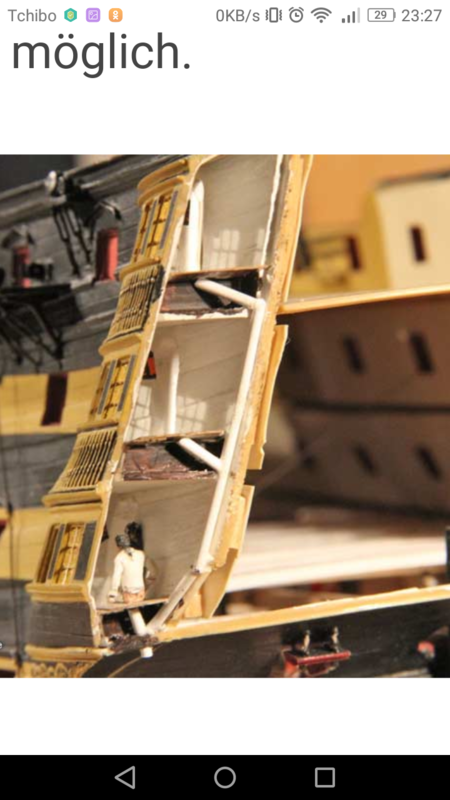 Added to these practical considerations, I realized that what turned out to be a nice detail would only be covered by my open, lower deck port lids. So, I bit the bullet, scraped em’ off and am in the process of re-doing them. As yet, I still need to fair them into the ship’s sides and re-drill the hole. The other interesting detail that I picked up from the monographie is that the scupper ports just forward of the main mast (middle deck) and aft of the main mast (lower deck) should have a wider mouth. This only makes sense, when you consider that the point of the pumps is to drain water quickly. So, I re-made these scuppers, as well. I had some hesitation in introducing such a large hole into the hull, so close to the waterline. In practice, though, the lower scuppers would have been fitted with a kind of anti-backflow sleave. I have some ideas about how to represent this, but I will worry about that much later on in the project. The other revision I have had to consider is the fact that my stern counter, as I originally fashioned it is exaggerated both in it’s projection, and it does not make any allowance for what should be a “false” lower stern balcony that, essentially, provides a ledge of support to the four seasons figures. The solution, I think, is the sort of compromise that has defined this kit-bash. I am fashioning an extension that will create this shelf, while somewhat correcting the projection issue by bringing the stern counter more into the vertical plane. The compromise is that the fashion pieces must, then, extend even further (about another 1/8”) aft, of what was already an exaggerated posture above the wing transom. Going way back in my modifications - remember if you will - that I shaved back the stern profile by about 1/16”, from the break of the stern counter down to the waterline, in order to create the appearance of a “round-up” to the square-tuck stern. This gave the fashion pieces a more (and, IMO, not unpleasing) rakish appearance. So, first I faired in an extension piece, then I sketched in the new profile to an 1/8” projection from the face of the stern. I thought this was a bit much, so I reduced the projection by 1/32”. This is my final profile. I may or may not fill in the short wale segments. I’m not sure it really matters because the QGs will cover that, anyway. What makes me feel better about all of this is that the lower finishing of the quarter gallery sweeps down, overlays and obscures this exaggeration of the fashion pieces. A little bit of fudgery. Comme ci, comme ca. Thank you, Mike! I am likewise enjoying your Renomee build very much. 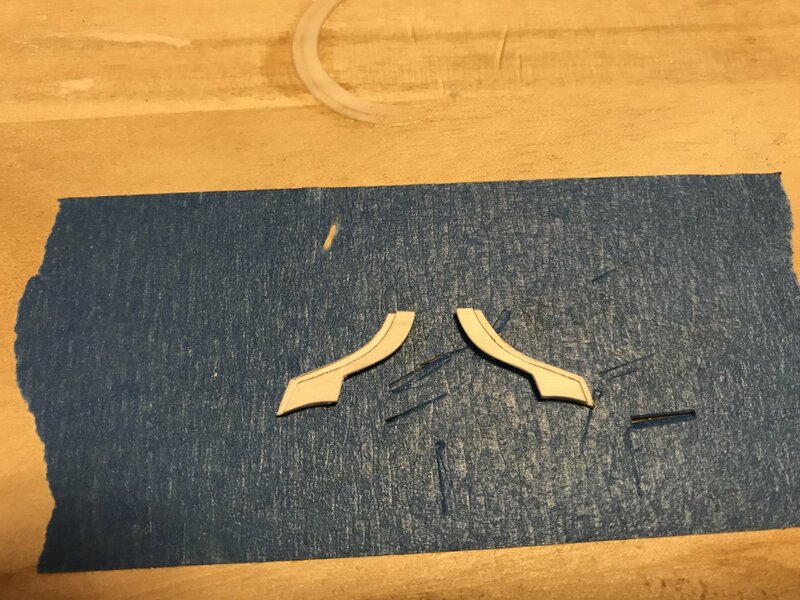 Of course, the annoying thing was that I came to this realization that my middle deck scuppers were in the wrong position, the very day after I had glued in the new wide scuppers at mid-ships. Consequently, while a wide scupper may be more appropriate, and an upgrade of the detail, my new scupper is still centered on a port, at the middle deck level. My thinking was that the scuppers should line up directly with the locations of the pumps, which they do, just forward and aft of the main mast. At this point, I’m kind of inclined to leave it, as is, but I may re-visit this one after I am satisfied with the stern counter. Making up the wider scupper stock was a bit of a process, and I am just feeling a little lazy about re-doing it, at the moment. It took some back and forth to arrive at good symetry, but I was finally satisfied with my “false gallery” extensions. 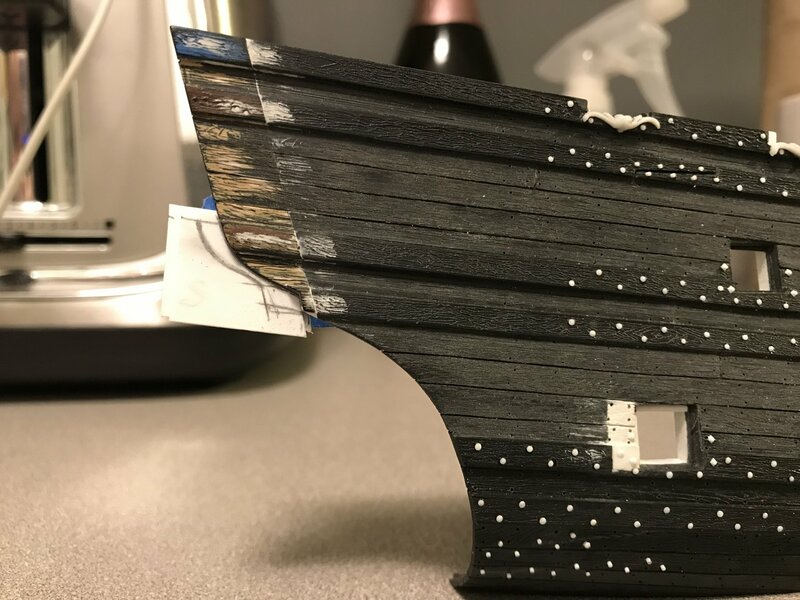 The most time-consuming aspect was cutting-in the planking rebate into the aft-most edge. Although as I mentioned before - the overhang of the fashion pieces, above the wing transom is pretty exaggerated - the outline of the false gallery, which will define the shaping of the QG, just below the middle deck windows, is now more close to correct. After the glue dries, I’ll fair the bottom edge into the fashion pieces, but I am now happy with this. Next, I’ll scrape off those wide middle deck pump scuppers one more time and position them so that they could function properly AND be seen with the port lids open. What would be the point of including the detail, if it were hidden? Then, clean the shells; replace anything missing or damaged bits; prime and then paint. I hope to at least have the shells primed and the ventre-de-biche base coat down before I move my family to Brooklyn, next month.